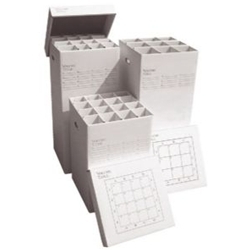 Economical solution to organizing plans in office or permanent storage. Sturdy, stackable, attractive corrugated cardboard with reinforced bottom. Gray lettering on white background. Side handles with identification labels on interior and exterior. The MGR-25 and MGR-37 have sixteen 4" x 4" slots. Partitions can also be removed to create four 8" x 8" slots. The MGR-25-9 and MGR-37-9 have nine 5¼" x 5¼" slots.